If you simply want the best water softener out there, we did the job for you and researched different products, finding the Culligan WH-HD200-C Whole to be our top pick. This one is a filtration system that has a bypass shutoff valve to make it easy to operate while it already comes with a 1-inch inlet. It is ideal for whole house operation and has been certified by world standards, such as ANSI and CSA. For those with an extra budget for a water softener, the Watts Premier 531105 may be a good choice for you. It is a pack of filter solutions that are intended to be used for reverse osmosis. This set contains carbon pre-filters, sediment, post-filters and many others. The ResCare RK41N All-Purpose may be what you want if you’re on a tight budget. This softening product is a cleaner that contains 1 gallon in one bottle. It can also be used for an existing water softener as a cleaning product so that the quality of the liquid produced will not be altered by content and mineral buildup. A water softener can be helpful for places with hard water. Water softening is the process that involves taking out trace elements in any hard water source, hence “softening”. It is often done by a water softener, which is a kind of filtration system or tool that does the job. There are also special water softeners that come in bottled form. There are two kinds of sub-methods for softening water: ion-exchange resin and reverse osmosis. Both of them have their differences and similarities. The ion-exchange resin method exchanges sodium ions with the hard ions of calcium and manganese in hard water, thus making it softer and with fewer metal elements. In short, the sodium content is exchanged with the trace elements and minerals. It can be kind of a not-so-healthy thing for the body to intake too much sodium (see below) and this is why this method is not always used for a filtration or softening process throughout the world today. Reverse osmosis is a common filtration process. The reverse osmosis is another common way of softening. It makes the use of hydrostatic pressure in which hard ions of manganese and calcium are filtered away using a special membrane. Reverse osmosis is the most common way of water softening or filtering. If you check out your local filtration shop or company, they will most likely be using reverse osmosis as a filtration method. Distillers can be quite a fortune to set up. Distillation is another common method but can be downright expensive. If you want your water to be thoroughly pure, distilling it is the best way possible, especially for newborn babies and people with sensitive stomachs to trace minerals, even in nonvolatile salt forms. Distillation is only suitable for those with delicate medical conditions to ensure that the trace elements do not get in the way of their medication and healthy recovery methods. Water softeners may also have downsides when used repeatedly. This is because of the sodium content, which may interfere with a person’s health and diet, and may also lead to urinary tract infections and disorders. Sodium is a common part of the ion exchange process. Sodium-free diets have been rampant nowadays as kidney and urinary tract problems can be a threat to a person who has consumed too much sodium in their body. There exists some salt-free softeners that have a resin tank with preventive measures for scale build-up. Purifying liquids can be beneficial for people with sensitive digestive systems, but it may not be that needed if you have a strong immune system. Many studies have concluded that mineral water is still very beneficial for people because our body does still need trace elements at some point. Type: it can either come in a liquid form in a bottle or as a system or machine tool for a bigger scale of operation. The liquid form is cheaper, of course, but the machine is what you will really need in order to make the liquid work properly to filter out your desired liquid from trace chemicals. The machine one should be easy to set up (more on that later) and the liquid solution should come with user instructions on how to use. Amount per bottle: you have to know how much formula is contained in each bottle, usually expressed in ounces. The amount is important depending on how much you need to use in one go. Since most will be used for a filtration shop or business, it is usually in larger quantities so the more ounces is in the bottle, the less you have to buy in the long run for your filtration business. Eco-friendly: you have to make sure that the formula is safe for Mother Earth at least. The chemicals should not be too harsh when you throw it away. The smell should not be too strong as well. You also have to consider the list of ingredients that are included in the liquid solution. Ease of use or installation: the machine should be easy to use and to install with the right amount of directions as to how to operate it. The liquid solution should also have indicated amounts as to how much to mix in one given session. Since it will be a delicate process, the user instructions should be easy to understand, especially for those who do not have experience with any filtration process whatsoever. Certifications from governing bodies: you should also choose one that has sufficient certifications from governing bodies that dictate world standards when it comes down to any filtration process. This ensures that the product or the machine will be operating as smoothly as possible and the liquid mixture will work as intended to soften the water in the safest way possible without the risk of leaks. The scope of operation: some are intended for home use while some are for business use. Home use machines can be rare because it can be quite costly. At the very least, most people will use it to establish their own filtration shop or station to make sure that their drinking source is clean and safe for all or to sell filtered water. Accessories included in the machine system: this can be important to make the setup a breeze overall. The instructions should also teach the user how to use the included accessories. Compatible machines (for formulas): the softening formula should be compatible with a specific filtration machine. It is usually written in the instructions and labels of the product. There are some liquid solutions out there that can only be compatible or recommended to be used on a specific brand of filtration machine, so be careful when choosing one. As our top pick for the best water softener, we chose the Culligan WH-HD200-C Whole, which can be ideal for a whole house filtration system. It is great for homes that need a lot of clean filtering as well as those who want to be able to use it for a filtration system for a business. The included 1″ reinforced inlet and outlet connector made of stainless steel stands to be durable for long-term use and it also makes the installation a lot easier as compared to other brands. Adding to that convenience would be the mounting bracket to make sure that you can get started on filtering out sediments in your water right away. It can potentially reduce corrosion and sedimentation from your liquid source because of its great filtration qualities and certified quality parts. It also works under a 40°F – 100°F temperature range so there is no need to worry about your climate at home. There is also a filter life indicator so that you will know when exactly to make the change for your filter – this can save time and serious savings. This product has been certified by CSA B483.1 and NSF/ANSI 42 for safety and for functionality when it comes down to filtration and even for reverse osmosis processes. It is an easy to install product overall due to the clarity of the user instructions, while the pressure relief valve also works as it should. The Culligan WH-HD200-C can work from 30 to 100 PSI of pressure range so it is definitely okay for use in extremely hard conditions where clean water is not accessible. What’s more, it can be used alongside R50-BBSA and CW25-BBS filter cartridges so if you have those, it can be a breeze to replace. Adding to its included hardware would be the housing wrench. Overall, this unit is ideal for heavy duty use (e.g. for a filtration station business). While not a deal breaker, the Culligan WH-HD200-C Whole does not have an active pressurized water spray, which is only found on higher-priced units, anyway. As our step-up pick for those who prefer something with more features, the Watts Premier 531105 can be a great choice for those who need a set of 2 carbon pre-filters and 1 carbon post-filter plus 2 sediment pre-filters in one package. This can save you a lot of time because it basically has everything you need for 1 year in terms of softening liquids and drinking sources. 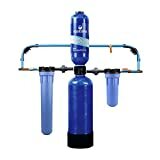 You can find this usable with any reverse osmosis system because of its great compatibility as said in the user instructions. What’s more, this set can be ideal for the one-step filter change, which makes it easy to install in general, providing a simple assembly method for those who are not very knowledgeable with filtration systems. If the filter needs to be changed, you just need to lift the filter holder for ease of replacement, which saves time and effort overall. This system or package can potentially remove lead, arsenic, radium, chromium and the like from your source. As a dedicated filtration system, this unit filters up to 5 microns, which can already be a big thing for most households and businesses. It has a user manual that is easy to understand and has a construction that prevents leaks. It has a 50-gallon per day capacity of filtering as well, which can be sufficient for most homes. For those with less budget at hand, a 1-gallon product to consider would be the ResCare RK41N All-Purpose. It is an all-purpose cleaner and softening formula which can be compatible with various systems out there. In addition to that, it can also clean control valve parts so that your current and existing system will be able to function properly. Each container can last a year because a little goes a long way – saving time, effort and money. It is ideally used at 4 ounces per cubic feet so you do not have to put a lot of formula in just one go. 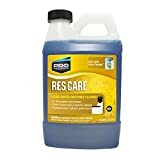 The ResCare RK41N All-Purpose also works for softener beads, so it can also effectively clear out any impurities in your source. Getting rid of iron buildup can be a challenge for most households that do not have a clean source, and this is why this formula is made for that purpose as well. It adheres to the NSF/ANSI Standard 60 as well as being ISO 9001:2000 certified to make sure that it definitely works for most filtration systems, providing your drinking source with no smell or aftertaste at all, free from iron, manganese and other metals. If you want a water softener that is more ideal for whole house operation needs, the iSpring ED2000 Whole can be a great choice for you. This integrated system generally prevents scale buildup aside from cleansing the source that you have. This is important so that your source will not be contaminated further right after you have filtered it. Preventing build-up in the unit also helps you to maintain a good lifespan for the system and at the same time, clear out the instances of clogging and the like. And because it works without the need for chemicals, it can be an eco-friendly solution to filtering our your household source. It has been rated for 10 to 19 grains of hard water areas so it is pretty strong. The unit also has a 4.25″ coil length so it is a lot easier to connect and install altogether. Many reviewers have also found it usable for a water heater system – perfect for when you need to take a shower but don’t want the awful smell of iron oxide at hand. Many of these customers have also narrowed down the hardness to 140 ppm and even up to 130 ppm with the help of this unit. Generally, the installation method can take up less than 15 minutes of your time, depending on various factors, so it is pretty friendly towards users who are new to filtering systems. Overall, many users have agreed that you can potentially see results after two weeks of usage for your source. It is also backed by a 1-year money-back guarantee. If you want a resin form as a water softener then your best bet would be the ABCwaters SOFRES1, in our honest opinion. 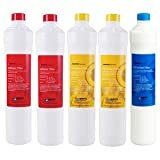 This budget saving bundle contains a total of 1 cubic feet of softening resin so that you can readily use it for your intended purpose – whether for R/O or reverse osmosis or many other types of filtering systems. Being a USDA, NSF, FDA approved formulation, this solid pack is also 8% polystyrene cross-linked so you can be assured that it will be safe to use in most systems. It also provides you with 12 to 15 years of shelf life so that you can be able to store it whenever not needed and keep some for future use. A worth noting thing about this unit is the fact that the particle size range is 1.2 mm H+ 5% max so it does not have problems when it comes down to clumping, which can frustrate some people. It will be able to treat hard water in a good way due to being fine in its resin formation. Also, it can be used with a shop vacuum to remove old resin in your system, as described by some reviewers. 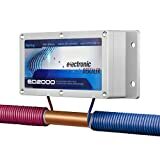 Additionally, some have noted that it will also work for a 5600 Fleck unit, if you have such a system, and will also generally work for standard softening devices. For those who want to be able to use something for commercial use (e.g. for a filtration station business at home or in the local market), the Aquasana 10-Year could be a great choice, which can grant you with up to 10 years or 1 million gallons of supply. Like most systems, it generally reduces chlorine (97% of chlorine), mercury and lead, but is more for the heavy-duty scale of things. Its included PVC fittings are not very easy to crack, which is important for durability and for the UV rays of the sun (and the test of time and underground flow pressure). Its fittings for the 0.75” pipe also make the connections a lot easier for setting it up with any sink or system. You can also enjoy the rust-free salt-free SCM technology to use for people who are concerned with sodium content reduction. The unit’s shut-off valves also work as intended and the whole system maintains 7 GPM of flow rate on the average – perfect for most homes and establishment. It also works on temperatures between 40 and 90 degrees Fahrenheit so it is not very meticulous about heat and pressure. It comes with a 20″ pre-filter and post-filter and it won’t demineralize your water, unlike others. Made with UV Filtration for its system, the Aquasana 10-Year is pretty tough with its brass fittings and bend supports on the hardware side of things. Like most filtration system units, it also eliminates chloramines for a healthier and safer drinking or bathing source. It is backed by a 10-year warranty. The Whirlpool Cleanser may be what you want if you want to choose a liquid form for softening your source. It is ideally used every 4 months and it gives off no foul odors so far, as described by many who have tried this product. It also eagerly maintains your filter’s peak efficiency and makes it easy for you when cleaning the nozzle and venturi parts of the unit that you are currently using. 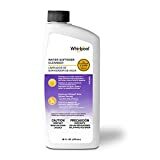 Made to reduce iron and scale buildup in general, each container of the Whirlpool Cleanser comes at 16 ounces, which can be enough to reduce oxidized iron and manganese in your source. It is backed by a 1 to 10 years full parts and labor warranty. the iSpring WSP-50 Reusable may be your best bet if you prefer something that is meant for sediment filtering (e.g. for sand and similar deposits). Its two threads at 1-inch MNPT and 3/4 inch FNPT can make the connections easier for your local connection or source, making the setup a breeze overall. With a maximum of 20 gpm (gallons per minute) for its flow rate, it is pretty decent as a unit and is only 1 lb in its dry weight so it won’t take a lot of muscle to install it onto your intended location. With a 50 microns rating, it is sufficient for most homes and establishments in terms of filtration. The stainless steel mesh filter screen also stands to be durable for the test of time (and flow rates). The unit can withstand 40 – 100 °F of temperature range like our previous picks, but it also requires daily or weekly flushing, like all of them, to make sure that it works smoothly and properly. It is also a flushable and reusable unit that can withstand 20 – 90 psi of pressure so that it will not easily give up on very high flow rates of service providers. You can also be able to use the iSpring WSP-50 for reverse osmosis systems. It also has a see-through the housing so that you will know what is going on inside the machine. Its multi-layer gradient filtration system can also prove to be useful for business filtration use. It is backed by a 5-year warranty. 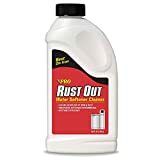 For those who have tremendous problems with rusting and heavy iron build up, you might want to try using the Pro Products RO12N for whatever filtration system you are currently using. The product can be used with salt bags to make sure that the iron oxide is clear and out of the way. Each container of the Pro Products RO12N has 1.5 lbs of rust-removing formulation that reduces sulfur smells when applied properly. It generally cleans up brown water so it is useful for areas that have iron-smelling sources. It can also work as a rust and stain remover for existing systems so that it will not contaminate the end result of the filtration process. Overall, this unit is safe to use with an R/O (reverse osmosis) system, if you have one at home and is also deemed safe for a septic system, as pointed out by those who have used it. If you simply want a water softener intended for a pet hermit crab in saltwater, the Zoo Med Hermit is a good choice for you. At 2.25 fluid ounces in one pack, you only need 1 teaspoon per cup to treat the source so that your sea pet will not feel disturbed by the lack of treatment for its environment. This formula generally takes out chlorine and ammonia, which is great for hermit crabs. There will be no worrying about clumping due to being in liquid form. It also adds natural sea salt alongside removing chlorine. There is no need to worry about getting the right amount onto your aquarium since it already comes with a handy measuring cup. It also adds calcium to the water source. There were others that did not get included in this list due to lacking reliability for the machine and not being eco-friendly for the formula, which might put off environmentalists. Q: What are the different benefits of a water softener? Balances your sodium intake There is a kind of process that allows you to put just the right amount of sodium in your source. Too much sodium can lead to urinary and kidney infections, while too little sodium can also be bad for your body. A good balance of sodium is enough to help you achieve a healthier and balanced lifestyle. Balanced mineral consumption There are minerals that are present in your drinking source that is not really beneficial to the body. However, there are also minerals that are okay for the body. With the help of a softener, you can maintain a good balance between the two. Helps your pipe and faucet last longer With a softener, you can help clear up the buildup of anything that gets stuck in your faucets and pipes. This can ensure that your plumbing system can last longer with less likelihood of having to call the local plumber for a leak or clogging issues. Does not damage kitchen utensils There are certain minerals that come out of hard sources that may damage a kitchen utensil and cause corrosion. If you ever own a carbon steel knife then it might get rust easily if your source is not clean. A healthier skin Many people and experts agree that having a properly filtered source using a softener can be friendly towards your skin. There are some people who may be allergic to certain metals and minerals, even in little amounts, and that’s why they can get rashes and such. With a softener, it might be alleviated. Conserves appliances In addition to helping kitchen utensils sustain less damage from harsh metals, it also does the same thing for appliances in the kitchen, such as cookers and refrigerators. Great for a heater system If you have a heater system then you should definitely consider a softer because the mineral deposits can damage it as well when not cleaned properly. Great for cleaning appliances Cleaning appliances like washing machines will get clogging if you do not have a softener. A softener can help the source become free from sedimentation and other debris to make sure that clogging will less likely happen when washing clothes and the like. Q: Can it be possible to safely drink softened water sources? It really pays to have a clean and safe drinking source. A: Yes, softened sources can be safe for drinking. This is because they are still safe and have been filtered out to remove most of the harsh chemicals and minerals like iron oxide and others. The only downside for some people when it comes down to softeners is that they leave a slightly salty taste, which can be bad for people who are maintaining a strict sodium diet. Q: Which minerals are found in common tap water? Calcium is a mineral commonly found in milk. Q: How much of these minerals are required for the body daily? Q: How does adding salt help a water softener? A: This is called the ion-exchange method in which salt is exchanged with the hard minerals like calcium and magnesium. In this way, the salt or sodium is retained in the water while the hard minerals are cast out, resulting in the softening process. Q: How much salt should be added to the softening device? A: The softening device should receive about 6 to 8 lbs of salt per 1 cubic feet of resin. Again, this may depend on the size of your tank, such as a brine tank, and you should also consult the user instructions as to how much salt is recommended for the said system. Q: What are the signs to tell if you live in a place with hard water? Q: Why should I filter a faucet? Filtering a faucet can have many benefits. Safe for children and pets Generally, you would teach your children to wash their hands before eating and drinking, but what if the faucet spits out iron oxide smelling source? You need a softener or a filter for that purpose. Controls the flow or pressure There are some filters and softeners that can also potentially control the pressure or flow so that it will not be a surprising splash or an annoying small drop when you open the faucet. Ease of installation Most of these softeners and filters that are specifically made for faucets can be easy to install. Most of them are also lightweight and have simple user instructions so almost anyone can attach them to their sink and faucet systems. For cooking Obviously, if you are in a rush, you would have to grab your liquid straight from the sink, in which the faucet might have some harsh chemicals if not filtered. This can affect the quality and safety of your foods and drinks. Therefore, you should filter or soften it to avoid such problems. A: GPG stands for grains per gallon and is the way to measure the hardness of a water source so that you will know when to get a softener at hand. 1 gpg is the ideal rule of thumb, while anything that is hard is about 7 gpg or more. Q: How do you know when a filter or softener can be a great choice for your needs? Ease of cleaning We all know that softeners are cleaners as well, but we also have to make sure that the system in itself is also easy to clean in general, otherwise, it will still just get clogged too much when you use it more often. Good price You have to also consider your budget for the product – will you be using it for home or for commercial use? You have to know how much you are willing to spend or invest in the product if you really need it for your home. Great performance The level of performance can depend on how much stages of filtration and how effective the softener’s process tends to be in the whole system. Softeners often need the help of a softener product such as in resin or in liquid form. Durable parts The softener or the filter should be durable in most of its parts to avoid leakage in the system. This is crucial for those with extreme temperatures in which plumbing items can easily crack under the UV rays of the sun. Simple assembly Not everyone is greatly knowledgeable in terms of plumbing and filtration processes. Therefore, you have to make sure that the softener or filtration system has some decent user instructions in terms of assembly. Q: Do you also need a softener for an aquarium? Fish tanks, bowls and aquariums can benefit from softening, too. A: Yes! One of our picks above is intended to be used for a hermit crab tank, and that means that there’s no reason not to use a softener for an aquarium or a fish tank as well! Softeners for an aquarium does the job of removing chlorine and balancing the salt levels in the aquarium itself, making it more natural in term of habitability for the pets that you have, whether it’s a hermit crab, an angelfish or even a janitor fish. Q: What are the different kinds of purifier filters and their purposes? Charcoal filter These are the most commonly used ones today because they can eliminate most impurities from your source. They are used not only on liquids but also on dust in the air around your home. Activated carbon filter This is a bit similar to the charcoal filter but on a different price. Like the charcoal filter, it traps the dust or mineral to make sure that your source is potable. UV filter UV filter makes the use of UV light or rays to kill the bacteria and harmful chemicals that are present in your source. This is a more advanced way of filtering and can sometimes be more expensive. Ion exchange Ion exchange occurs when you exchange sodium ions with the minerals that are present in the source. This is a common method of softeners on how they operate. Q: What are some ways to prevent hard water stains from forming in your household? Rust stains can form due to minerals. Try a store-bought mineral cleanser, vinegar or lemon juice. Always keep your surfaces dry to avoid staining. Invest in a water softener to avoid such problems. Clean up the troubled surfaces once a week. Q: Why do I need a distiller? Children should only drink something that is safe and clean. For the kids Babies and children have sensitive stomachs and this is why they may need distilled drinking sources so that they can be free from potential viruses and sickness causing germs. For cooking It is a lot safer to cook and prepare meals with the distilled source. Because the process of using a softener can sometimes be a concern for sodium diet people, cooking with distilled source can be more ideal for them. Some distillers are portable You don’t always need to buy distilled drinking sources from your local grocery store – there are portable machines today that can help you distill your drinking source at home. Q: How is an ionizer different from a softener? Q: Can I use a water softener for a swimming pool? A: No, you would have to use a pool cleaner for that task. Water from the swimming pool is a lot more than your regular shower water, and this is why cleaning the pool would mean getting a separate pool cleaner to do the task. Q: Can you attach a water filter to a shower head? A: Yes, there are many brands of shower heads out there that allow you to attach a water filter for added convenience. This helps you to filter out the water that comes out of your shower, especially if you are stuck in a place where there is hard water all over the place. Q: What are the possible problems of the water softener making noise? Q: What are the pros and cons of reverse osmosis? Q: Which U.S. states are considered to have hard water? Overall, we’ve concluded the Culligan WH-HD200-C Whole to be our top pick for the best water softener, simply because it is already an all-in-one solution for filtering your liquids. It comes with everything you need, such as a 1-inch inlet and a bypass shutoff valve. Its ANSI and CSA certifications also ensure that it is deemed safe for a filtering station business.